Four-year-old Alice is a hoot and half! She is so funny and now she has all new material!! Check this out!! I have two very unique books to tell you about today. Joke books WITH its own laugh track!! Check out Belly Laughs Jokes For Kids and Belly Laugh Knock Knock Jokes For Kids. Each book has 350 jokes that are not only clean jokes but they are also EASY for kids to learn and remember!! First the books are hard cover books. Each book is 7¼” tall and 5¼” wide. There is a small speaker about 1½” around that when pushed laughs. Not just any laugh a very silly contagious laugh. I’m not sure if Alice is laughing over the joke or the laugh track!! Belly Laugh Jokes for Kids: 350 Hilarious Jokes written by the Sky Pony Editors and Illustrated by Bethany Straker. In case you couldn’t understand Alice. The joke is “What kind of flower is on your face?” Tulips! 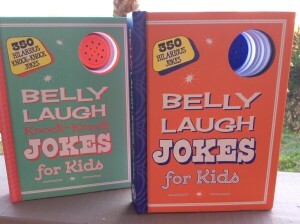 Belly Laugh Jokes for Kids is jam-packed with old jokes I’d heard before and new and original jokes. The kids laugh hysterically! Alice loves making people laugh with her new jokes, she has taken to telling her teacher a new joke every Monday. She has quite the repertoire of jokes already! Belly Laughs Jokes For Kids is filled to the brim with both classic and original jokes to make readers keel over in laughter. Developed to meet the needs of the millions of children eternally hungry for joke books, this collection is complete with 350 hilarious jokes for kids. This unique volume is complemented by silly line drawings created by talented illustrator Bethany Straker. It’s seemingly endless supply of fresh content and splashy, engaging design make this book a sure source of fun for young readers as well as parents, siblings, and friends! Perfect for long car rides and rainy days, this book is sure to bring laughter and fun to little ones. Includes laugh button for extra silliness! The illustrations fit these books perfectly. The jokes are so funny. Even the ones that make you roll your eyes! You can find Belly Laugh Jokes for Kids on Amazon, Barnes & Noble and other bookstores. Belly Laugh Jokes for Kids is packed with both classic and original knock-knock jokes to make readers keel over in laughter. Developed to meet the needs of the millions of children eternally hungry for joke books, this collection is complete with 350 hilarious knock-knock jokes for kids. This unique volume is complemented by witty line drawings created by talented illustrator Bethany Straker. It’s seemingly endless supply of fresh content and splashy, engaging design make this book a sure source of fun for young readers as well as parents, siblings, and friends! Perfect for long car rides and rainy days, this book is sure to bring laughter and fun into your home. Another absolutely beautiful book. Jam packed with Knock Knock jokes. 350 jokes to be exact! 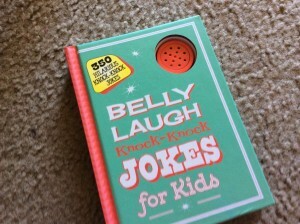 You can find Belly Laugh Knock Knock Jokes for Kids on Barnes & Noble , Barnes & Noble and other bookstores. One more joke from Alice! In case you need help with this one “What do you get if you throw butter?” BUTTERFLIES!! The illustrator for both books is Bethany Straker is an acclaimed illustrator whose work has been featured in numerous books, including Smelly Ghost, Ruby Moo’s Deep-Sea Adventure!, A Curious Robot on Mars!, Springy Chicken, The Spotty Dotty Daffodil, and The Funny Bunny Fly. She lives in Kent, England. Are you kidding? If I can make the Grandkids laugh I am in!! Cute books! Clean easy to remember jokes? I am 100% in!! Super cute books!! Oh heavens, she’s at that stage already! Just wait till she starts making up her own that are only funny to her but you have to laugh anyway. Lots of groaners to come! This is a great idea. Good way for little ones to start memorizing and building up those brain “muscles”! and in the meanwhile, giving their loved ones lots of chuckles! Lol, a born comedienne! My 6 year old nephew has discovered jokes, too. This might be a good stocking stuffer for him! I recall a joke book when I was a kid that was easy to read with silly jokes. Seems each generation has one. Sounds like a good book 🙂 I love jokes, more so I love to laugh and this would be fun for the whole family. Nice, my kids love jokes! 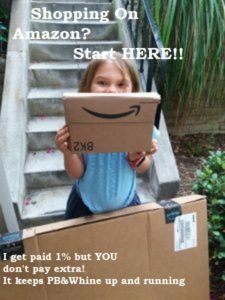 The Importance of Getting Your Kids to Go Outside and Play!! Darcus Tori Pink Heart Diamond Stud Review & 100% Off Coupon! !